The subject of spanking is found not only in prose, but also in all kinds of poetry. Spanking verse describes poetic work that is primarily spanking focused. But there is also poetry that has its focus elsewhere and just contains a brief reference to spanking. 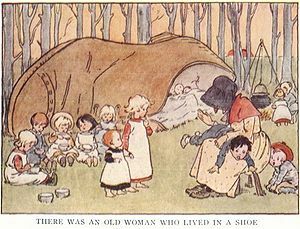 Illustration for the nursery rhyme "There Was an Old Woman Who Lived in a Shoe". According to one interpretation, the "shoe" is (southern) Italy and the "old woman" represents rural members of the Catholic Church who lived in great poverty. Partly due to the Church's position on birth control, these people often had a great number of children, resulting in malnutrition and, not uncommonly, domestic violence. So the verse criticizes the Catholic Church. Another interpretation says the "shoe" stands for the British Isles, the "old woman" is Parliament, and the "many children" are the colonies of the British Empire. Parliament "whipped her misbehaving children" by appointing the much-hated James I to the throne. 'Whare are you gaun, my bonie lass? 'O, whare live ye, my bonie lass? 'O, fare-thee-weel, my bonie lass! But thou has a waukrife minnie! There are also spanking references in "The Third Tour of Doctor Syntax in Search of a Wife" by William Combe (1742-1823), available from the Internet Archive at . Mrs Briskit, one of the ladies by whom the eponymous hero is romantically smitten, is frisky and flippant and she plays a joke on him. She arranges for a bevy of chaperoned beauties to call simultaneously for a romantic parley. The Doctor, realising what has happened, instructs his trusty Irish manservant Patrick to throw the ladies out. The spanking references are in the triplet from lines 15 to 17 and in the three couplets from lines 24 to 29. I care not how you get them off." I'll take the ladies off your hands! For love like mine hates ceremonies." But the muse must not mention where. Thus hurried onward with his story. Would soon restore her to her senses.